From when I was about two to six (fine, eight) years old, I had a security blanket named Bantina. Early in its life, the blanket was a baby pink with a darker pink, satin border. A few years in, the blanket was a dull gray with disconcerting spots because I took this blanket everywhere. If I went to the park, Bantina went to the park. When I went to the doctor, so did Bantina. And when my mom took me to the market, she took Bantina as well. This doesn't seem like a huge problem now. I see parents lugging around kids who refuse to change out of their tutus, kids talking to imaginary friends, and kids dragging all manner of security items around. Heck, a few days ago, I saw a kid wearing a colander on his head at the grocery store. When the mom caught me staring, she apologetically explained that the kid refused to go anywhere without the colander. Apologize not lady, I get it. See, these days, weird kids are endearing. But twenty-some odd years ago in Pakistan, if your kid's constant companion was a raggedy looking security blanket, well, people began to talk. This blanket was such a huge part of my life, a cousin actually sang its praises in a speech... at my wedding. Yup, we've clearly mastered the art of timing in my family. Recently, a friend asked me to concoct some treats to celebrate her brother's upcoming nuptials. She went on to explain that the treats had to be in the shape of a cute, furry monster. Apparently, the brother and the fiance have a furry, stuffed animal named Hank that fills a child/pet role. I didn't bat an eye. I, of all people, can't judge people's security objects. So, there I was, left to devise a baked treat that resembled a furry blob with eyes. Oh, and Hank had droopy purple arms and legs. And lets not forget his prominent pink ears. Thankfully, the friend gave me creative baking license. Lord knows what I would've done if she wanted Hank to be crafted as a dessert souffle or something. Or worse yet, if she wanted Hank to be carved out of a piece of fruit. The plan seemed simple enough a few days before D-Day (or more appropriately, Hank-Day). Vanilla cupcakes topped with shaved white chocolate and piña colada cupcakes topped with shredded coconut. 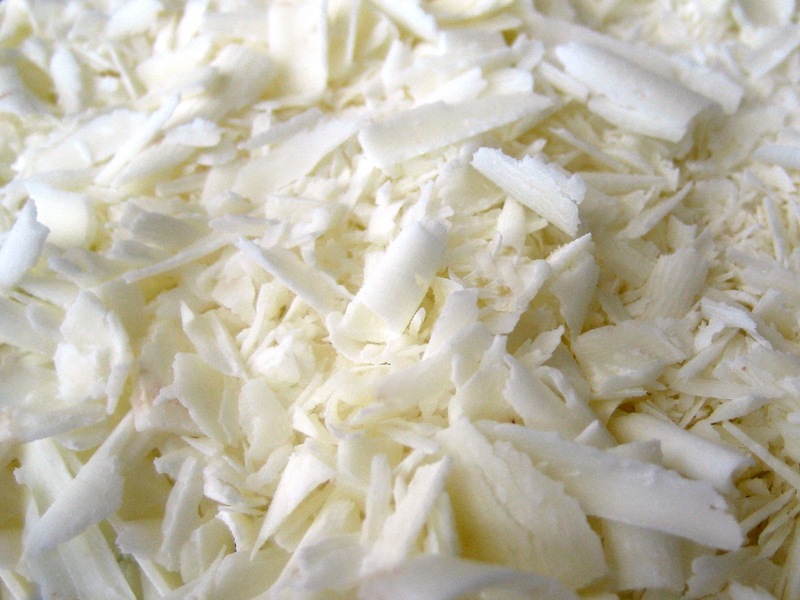 Both the shaved white chocolate and the shredded coconut resembled Hank's furry facade and the different toppings would give party guests some variety when choosing a cupcake. Bubble gum Jelly Belly jelly beans were perfect for Hank's ears. 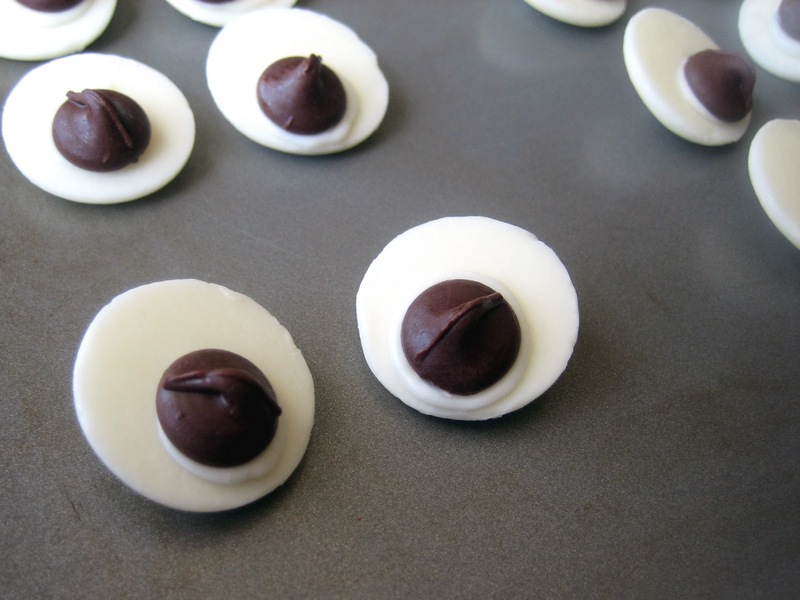 Chocolate chips attached to white chocolate discs for Hank's googly eyes. The problem was Hank's droopy appendages. I contemplated purple licorice (too heavy), blueberry yogurt covered pretzel sticks (not purple enough), and purple toothpicks (um, not edible). For a minute, I even contemplated modeling Hank's arms and legs out of purple sugar paste. Thankfully, the still-present red tinge on my hands from the last time I made red sugar paste reminded me of the follies of the sugar paste plan. Ultimately, I opted for no hands and feet for Hank. But you know what? The finished Hanks were still pretty darn tootin' cute. Maybe not as cute as a kid with a colander on his head, but cute, nonetheless. PS: If you missed this week's MasterChef, fret not my fellow foodies, rumor has it that I'll be cooking for the judges in next week's episode! If you're in the US, you can watch the first episode here. If you're in Canada, you can watch it here. Wait, so ... what happened to your security blanket? Did you...trash her? (I ask because I'm turning 21 in a few months and my pink security blanket, I'm somewhat embarrassed to admit, is lazing on my bed and staring me straight in the eye. Because blankets stare, obviously.) I honestly wonder if I'll ever grow out of my Blankie. The cuppycakes look darn cute and hats off to you for pulling it off so well..
Oh my gosh, Hank is adorable! I want a Hank and I probably wouldn't ever let go either. That is a really adorable story...but a colander is new. THAT is one kid who definitely walks to his own beat. I looked for you this week and will keep watching and rooting!! Those are SO cute! Had a wonderful laugh at the security blanket story. When I was little I had a bunny. He, too, went everywhere with me. A couple of weeks ago I had to get in one of the cedar chests and there he was in his shoebox. Grey, straggly, no eyes, one ear. So to the gal who asked about keeping her blanket - do. It'll be a great memory when you're 55! The cupcakes are adorable and I think taking a blanket with you is not as odd as a colander on your head, hehe kids are too funny! That's a great story! Your right, it is way more accepted and even expected that kids have a "lovie" these days. I had a big ugly orange bear that was so misshapen and dirty but I loved the guy. My step mom threw it away in my teenage years ;-( *sniff sniff. Did you keep yours??? 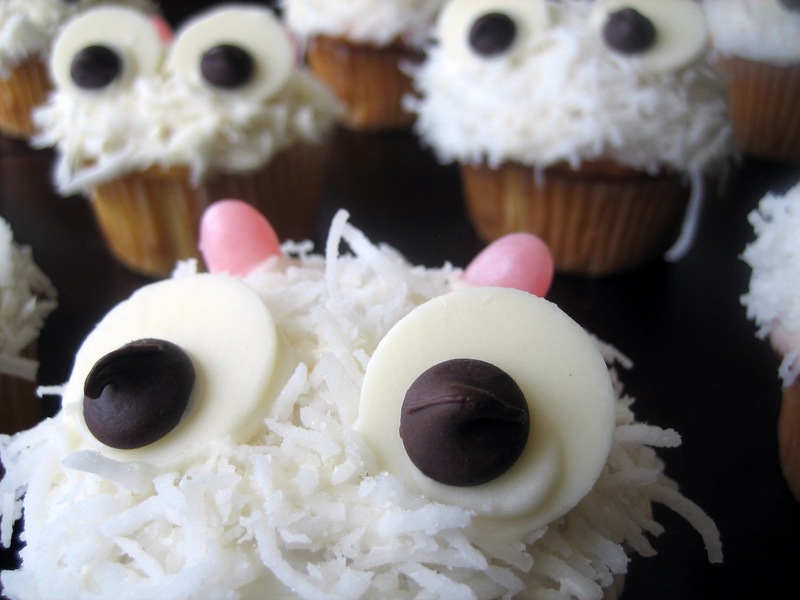 Anyway, I adore your monster cupcakes and my boys cought a glimpse of them so we will be making them soon! So this has to be one of the sweetest, funniest posts I've read all week. I also had a security blanket growing up that I still keep in my underwear drawer. 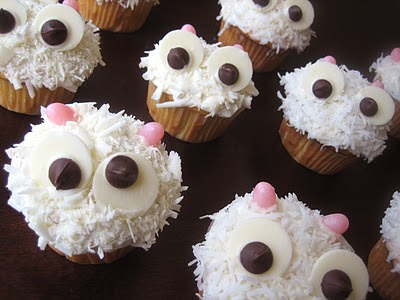 These cupcakes are adorable, and I can only imagine how special they must have been for your friends! Bantina is the cutest name ever, how ever did you come up with it? I refused to allow Maya to become attached to anything because I knew how hard it would be to break the habit later on. She'll likely need counseling for attachment issues at some point! The cupcakes are simply adorable. Seriously, you are too talented! Love it! My son has a blanket, no make that three. 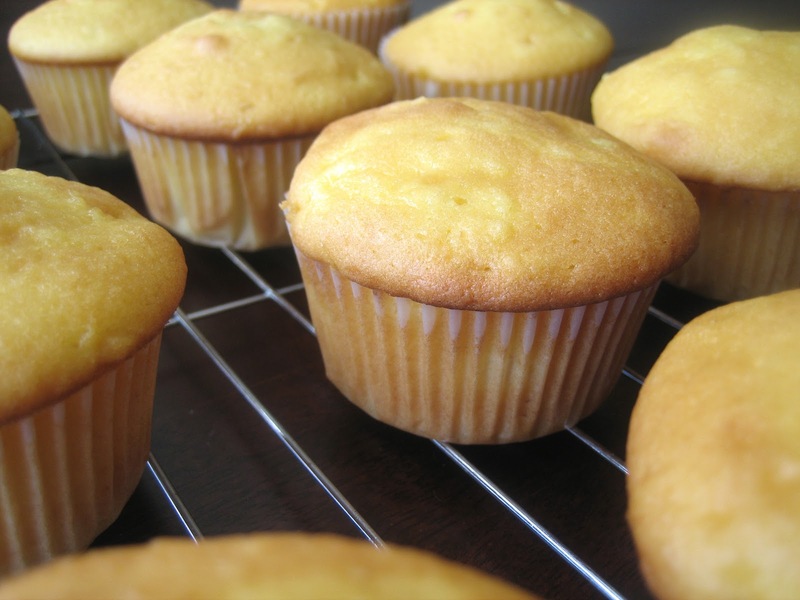 (= Your cupcakes are so cute and looks delicious too. And I was wondering what happened with MasterChef, I missed it! Congrats on making it to the second round! I'll be rooting for you! Those are some darn cute cupcakes Azmina! And I love the ingredients. Piña colada, white chocolate, vanilla are all my favorites. Wait, that doesn't sound right, are you only supposed to have one favorite? Whatever ;-). Oh and my daughter goes out with her dress-up princess dresses and my son brings sister's little pink toy stroller around. SIGH. So I totally feel for "colander mom". Haha. By the way, watched MasterChef and pvr-ed it for the weeks to come. Saw the big hug :-D. Can't wait to watch next week and cheer you on! So cute! I love decorated cupcakes like these. They're almost too cute to eat. Almost :) And I seriously laughed out loud at the kid with a colander on his head in the grocery. When I have kids, I'm sure they'll do weirdo things like that too! lol, that must be one blanket full of emotions and memories indeed, to make it to your wedding, too! What happened to it? Do you still have it? Belinda- I agree, that kid clearly had his own drummer. And thanks for the MC support! Kate- That sounds awesome. I bet it was so comforting to find your bunny. Forthelove- He looked like a little space alien with the colandar. I had to resist the urge to give him a high five! Healthy Mamma- I'm so glad! I can't wait to hear how they turned out and how the boys liked 'em! Monet- I'm so glad you kept your blanket! BakingSerendipity- Weird kids are the best. Normal kids are kinda boring. Could you be any more cute??? Does this by doppelganger association make me cute too? So flippin' adorable, and your fun friends provide lots of food adventures - love it! ps, piña colada + coconut sounds pretty rad. These are so CUTE!!! I love cupcakes. I missed it and will head over to watch on the link now. Pina colada! Yum! And so cute, too! I had a stuffed bulldog named Tuffy who protected me at night...is there a cupcake for that? Can't wait for the next Masterchef!!! confession time: i too have a blankie. i keep it in my closet and occasionally bust it out when i need a cuddle and my bf is gone. freaking adorable cup cakes and congratulations on the master chef. how cool?! Super cute cupcakes and love the blanket story! Who doesn't love a great blanket still? I LOVE IT... I had a "blankie" that sounds just like yours except it was white... now grey! Go so thin that I had to put it down. It now lives in a little box on my bedside table.. I know I am a lame. However I understand the connection to something comfy and secure. Those cupcakes look so cute. I love your blog and your stories and your twitter posts. Thanks so much for sharing your ideas. I have no clue how you have the time!!! I had an older cousin who's equivalent of Bantina was a tiny red pillow. I don't know when she finally outgrew it (if she ever did) but now, as an adult, I get it too. These are too cute! Wow, talk about talent... I don't know if I could have pulled these off. Great job! And, didn't everyone have a security something? I had a blanket that I may or may not still have :) Noodle sleeps with it now! Also, collander kid? Yeah, that would be something Noodle would do... totally! Can't wait for next weeks Masterchef! Binko was mine. And I still ummm....sleep with it. Yikes. Okayyyyy TMI... these cupcakes look awesome!!! I love them! I had a teddy bear and it's looking at me over the top of my monitor right now. When my parents took it away from me (we won't go there) they kept it and gave it back when I was an adult and they were pretty sure I wouldn't start lugging it around again. If it was as cute as your cupcakes, I'd consider doing it though. Adorable (as always). I never dragged anything around as a child that I can recall, but one of my good friends, at 25, still sleeps with her blankie. It's a small tattered pink thing, and hangs out under her pillow during the day and she brings it on trips. I just smile and nod my head. I walked around with my pacifier until I was...well...old. So I understand! These cupcakes are just the CUTEST! I would almost not want to eat one. Almost. These are the cutest cupcakes ever! Sorry but nothing can beat my oldest son's childhood "thing" - he loved firetrucks more than anything in the world, but unfortunately this happened before his language skills were fully developed. When he saw or heard a firetruck he started screaming out his version of the word which consisted of the F for fire combined with the uck from truck. I suffered many embarrassing moments and he had probably had the worlds largest firetruck collection because there was no way of shutting him up unless we took home every firetruck he saw in stores. If it was a real firetruck in public I had to run to the car as quickly as possible! Love the blog. I will revisit. Cute cupcakes, makes people feel special when you take the time. These are the cutest cupcakes! I love the little monsters. What a generous friend. Great job. My "fuzzy" still sleeps behind my pillow. It had a satin edge that I used to collect on my thumb, so half of it was detached from the blanket. The worst was when it had to be washed, even though I always requested it to be cleaned. Good times. Good luck on Masters! These are adorable! I love it. Those eyes are simply perfect. What a cute idea for cupcakes.